WASHINGTON — Declaring the Islamic State group’s destruction its top Middle East priority, the Trump administration on Wednesday urged coalition partners to contribute more to forces who are retaking Iraq’s second largest city and readying an assault on the extremists’ self-declared Syrian capital. There was no apparent announcement of a new overall strategy, however. Addressing top diplomats of the 68-nation coalition, Secretary of State Rex Tillerson called for new ideas to expand the fight against IS in the Iraqi city of Mosul and accelerate the campaign to chase militants from Raqqa, Syria, while preparing for the complex humanitarian and political consequences of both efforts. Yet Tillerson did not propose, at least in his public remarks, a new approach, beyond noting the increased U.S. military role in each country. As the officials were meeting at the State Department in Washington, the Pentagon announced that it provided an airlift for Syrian fighters taking part in an offensive west of Raqqa, in an escalation of U.S. involvement. Iraqi Prime Minister Haider al-Ababi said victory was finally within reach. “We are at the stage of completely decimating Daesh,” al-Abadi said, using the Arabic acronym for IS. Nothing Tillerson outlined departed significantly from the Obama administration’s strategy, which focused on using local forces to retake territory along with efforts to disrupt IS recruitment and financing, and the blueprint of the multilateral effort seemed unchanged. Tactics are complicated in Syria, where a partnership with Kurdish militants has prompted difficult discussions with Turkey, which sees them as a national security threat. The Pentagon made clear that in Wednesday’s offensive near Raqqa, U.S. forces were still in a support role. Tillerson said the United States would play its part and pay its fair share of the overall operation. But he said other nations, particularly those which have faced IS or IS-inspired attacks, must contribute more militarily or financially. He said increased intelligence and information sharing could overcome traditional rivalries between different agencies and governments, and advocated an enhanced online effort to halt the spread of extremist views, especially as the Islamic State group loses ground in Iraq and Syria. Although Tillerson alluded to the intensified campaign, he said the Trump administration was still refining its strategy. As a candidate, Trump spoke broadly about radical changes to the approach adopted by then-President Barack Obama. As a president, Trump has moved more cautiously. The reference to “zones of stability” appeared to stop short of “safe zones,” which the U.S. military has been extremely reluctant to commit to enforcing in Syria, even as Trump and others have raised the idea at various times. In an interview with The Associated Press, Hungary’s foreign minister said he liked what he heard. “We are enthusiastic about the new U.S. strategy,” Peter Szijjarto said, adding that he saw Trump’s administration determined “not only to fight against ISIS, but totally eliminate ISIS.” He said his country would send 50 more soldiers to Iraq, taking its contribution to 200. As the militants become more encircled, the mission will change. Officials expect in the coming months to see the dissipation of surviving fighters into underground cells that could plan and mount attacks throughout the Middle East, South and Central Asia, Europe, South America and the United States. Washington has been trying to get NATO, coalition and other partners to take actions to adapt to changing threats. 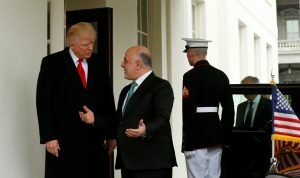 Left: President Donald Trump greets Iraqi Prime Minister Haider al-Abadi at the White House in Washington, D.C. al-Abadi is meeting with an anti-ISIS coalition this week in Washington. Photo by REUTERS/Kevin Lamarque.